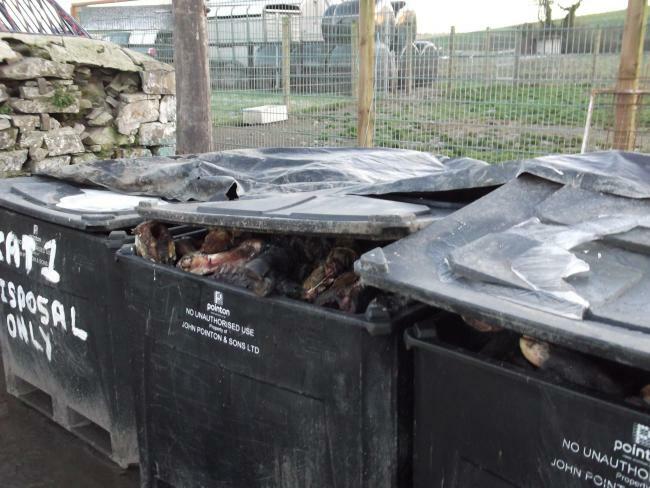 A Carmarthen huntsman has admitted a range of animal by-product offences including allowing chickens to roam on bloodstained floors, keeping overflowing bins of dead animals and bones, and leaving calf carcasses on the floor in the processing area of a centre he was operating from. William Pinkney, who is also a knackerman, pleaded guilty to 16 offences at Llanelli Magistrates Court and was handed a 12-month community order and must pay over £2,195 in costs in a prosecution led by Carmarthenshire Council. The court heard that the 42-year-old who operates a collection centre for fallen stock at the Carmarthenshire Hunt Club Kennel premises on Llysonnen Road – where he also lives – is authorised to collect and receive fallen stock of farmed animals. He is also authorised to feed certain parts of the animals to the hounds living on the premises. He admitted to magistrates keeping calf ears and heads in unlabelled bins, and not removing specified risk material (SRM) from a pile of calf carcasses – all SRMs must be removed and stained or marked with patent blue V and not mixed with other animal by products (ABP). He also admitted feeding hounds with contaminated material SRM, allowing chickens to feed off partly burnt carcasses and letting horses have access to manure heap containing animal bones. He pleaded guilty to not keeping up to date feeding records for the hounds, failing to keep current records of collected or delivered animal carcasses, operating the collection centre and feeding animal by products to the hounds after being served a prohibition notice, not labelling blue wheelie bins containing unstained bones correctly and keeping ABP bins outside overflowing and full of rotting carcases surrounded by a large number of maggots and flies. Also, bins were not closed properly leaving bones scattered around the floor area allowing wild birds and animals access to them. In mitigation Pinkney’s solicitor said that his client had reduced the number of fallen stock he deals with at the premises, and that he has spent money to make sure the premises is compliant. His solicitor claimed that when Pinkney took over the business he had inherited the issues on the site and that he was sorry he hadn’t been able to resolve them sooner. Pinkney was also told to carry out 120 hours of unpaid work and pay £85 victim surcharge. The council’s executive board member for public protection, Cllr Philip Hughes said: “This has proved very costly for Mr Pinkney who was aware it was his responsibility to ensure all guidelines were followed.